The Purchasing Division strictly selects raw material suppliers. The Quality Control Division and The Production Division make sure the product quality is according to standard. The Marketing Division evaluates the customer satisfaction periodically. 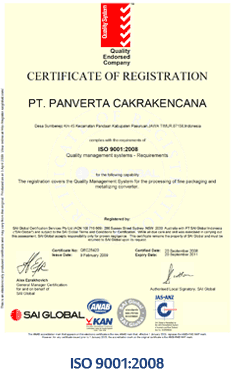 Panverta makes every effort to ensure that the standard of quality applied in every department complies with ISO 9001:2008 requirements. Prior to raw material procurement, the Purchasing Department conducts a stringent evaluation of all prospective suppliers. During production, the Quality Control Department coordinates with the Production Department to ensure that products are manufactured in accordance with quality standards. Once the products are ready to be delivered, the Quality Control Department will again examine the products during loading to ensure that they will be in prime condition when received by the customer. Quality monitoring processes continue through delivery to final usage by the customer. The Marketing Department evaluates customer satisfaction through questionnaires and regular visits.